Coal Valley, IL- New Surfaces From Floor to Ceiling! 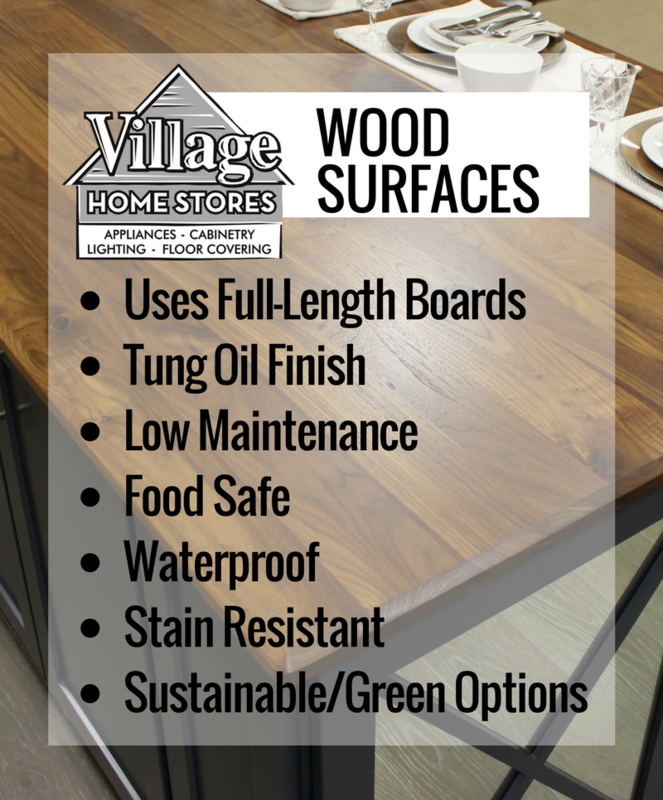 Village Home Stores is your one stop shop for all of the surfaces in your home! 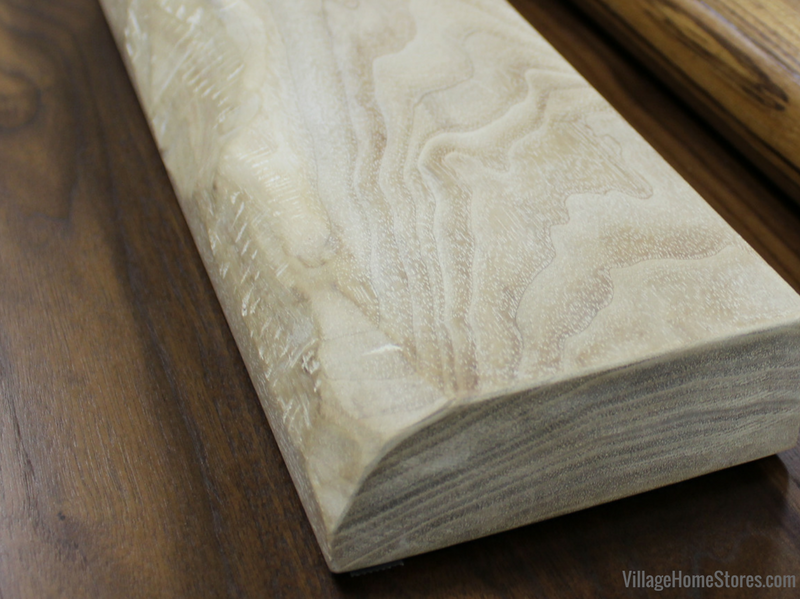 Our flooring department is so much more than carpet and hardwoods. 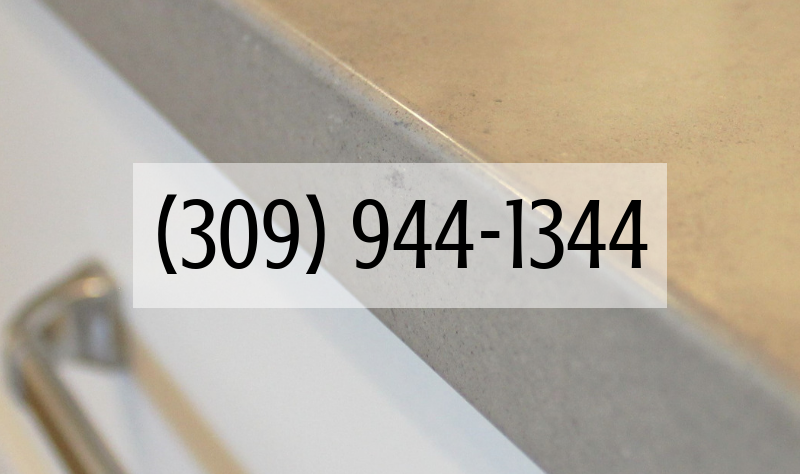 Our experts can assist in many other categories of surface products for your home. 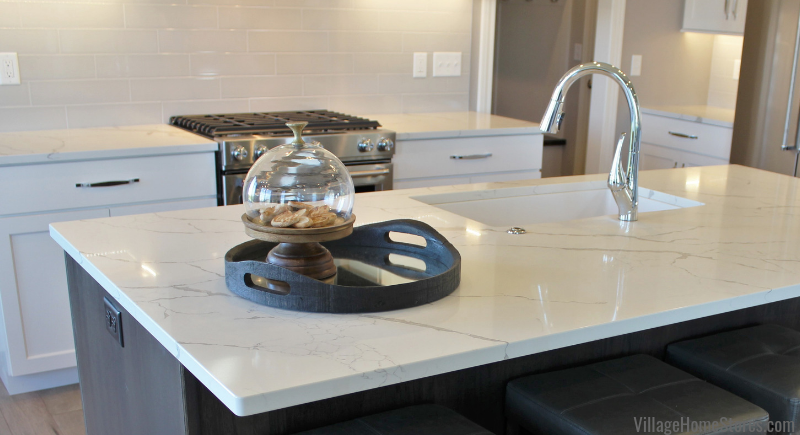 We also carry tile surfaces for your floors or walls and even a unique new peel and stick wallplank system. 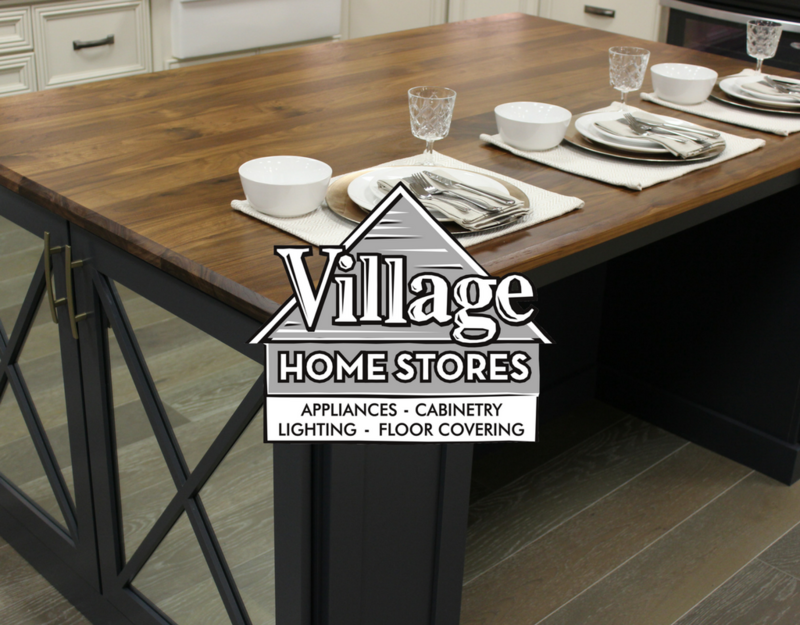 Check out the back of this Coal Valley, IL kitchen island that has been given a whole new updated look with our stick-on wallplanks. 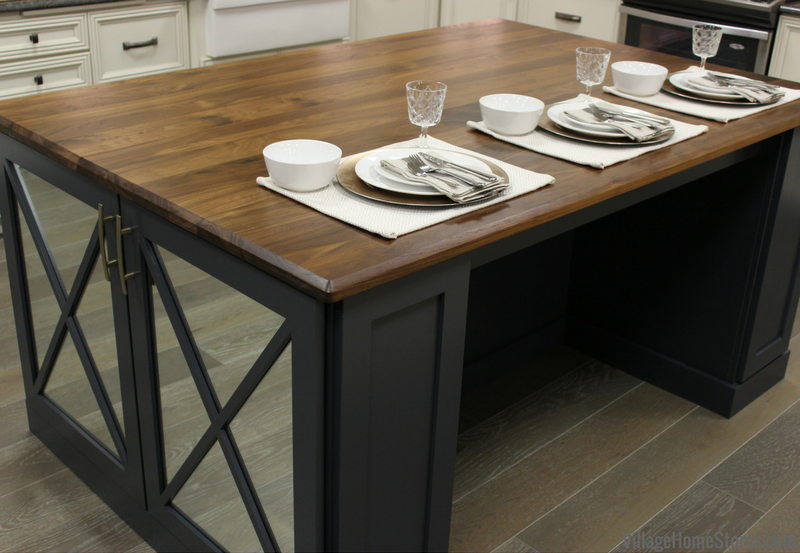 We installed bamboo flooring throughout (more on that later) and this white kitchen has been given a whole new look with a punch of texture and color on the back of the island. 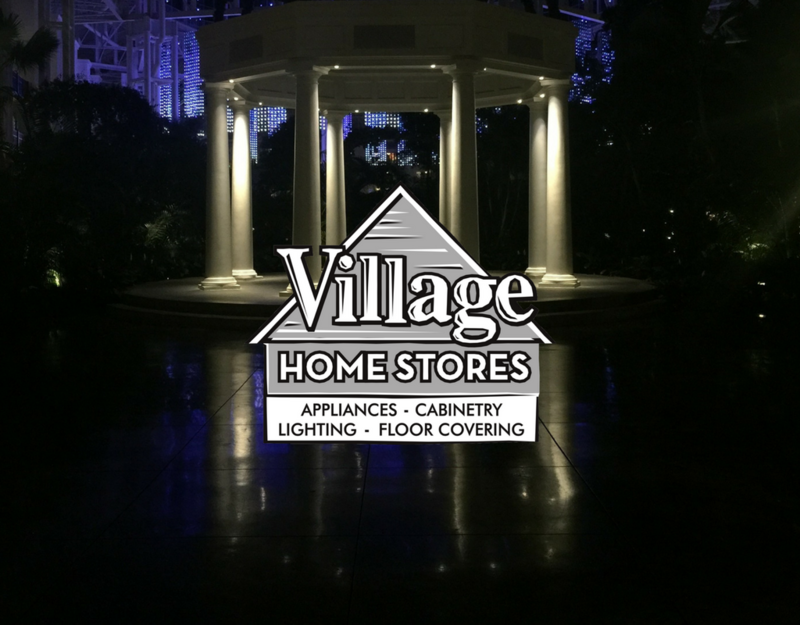 This stick-on product can be installed in so many unique and exciting places and a small project area like this can make a big impact. 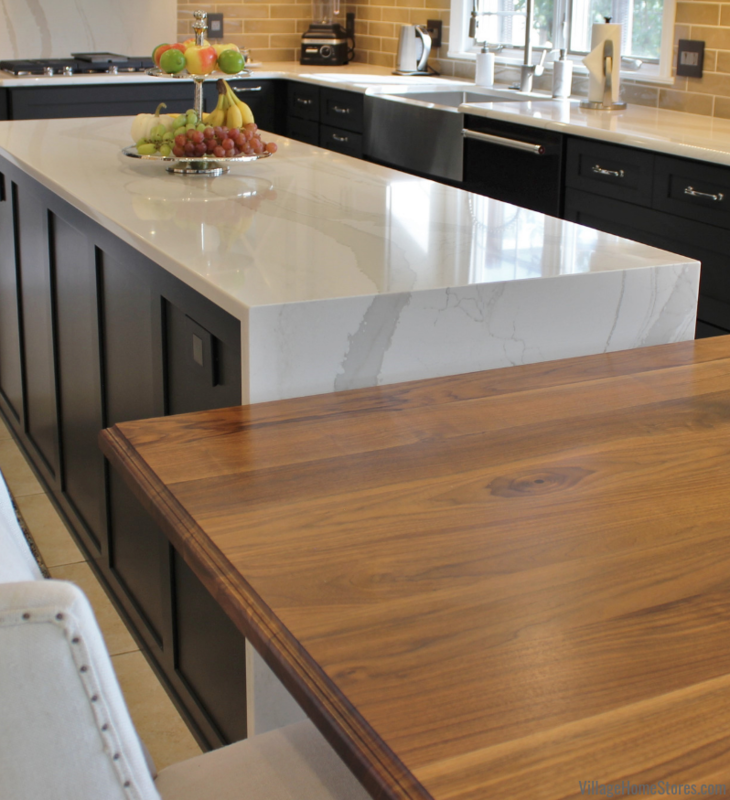 The island back shown is in the “Natural Walnut” color. 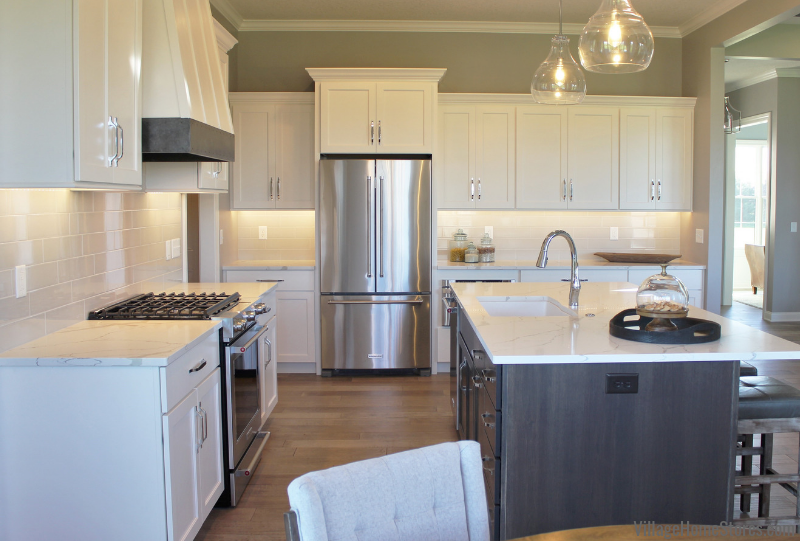 The color is much warmer than a painted shiplap and gives a modern/contemporary flair to the kitchen. 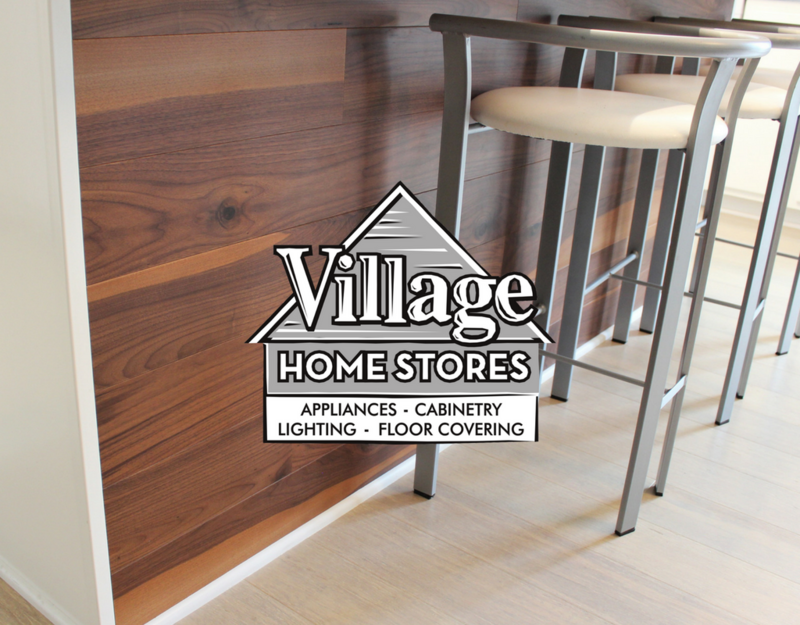 One of the best features about this product is that many of our customers have DIY-ed their own product install. Perfect for an accent wall or backing open shelf areas, this lightweight product is made in the USA and cuts easily with minimal tools. 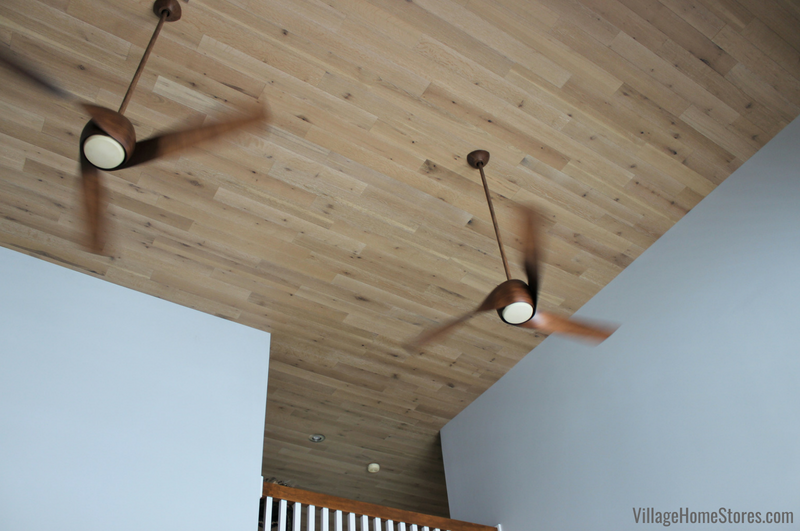 The durable topcoat on the planks clean up easily with a damp cloth. 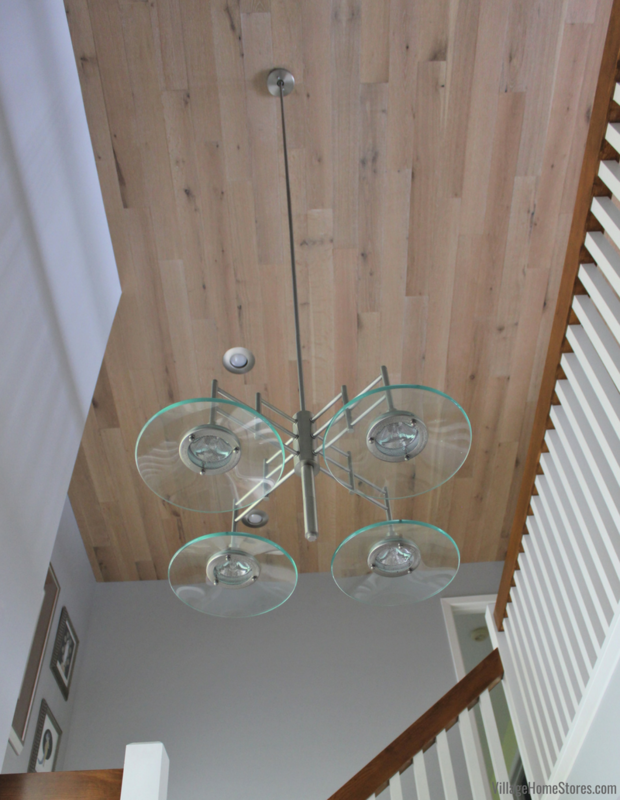 The wallplank we installed in the living room carried across the lofted hallway into the front entry of the home. 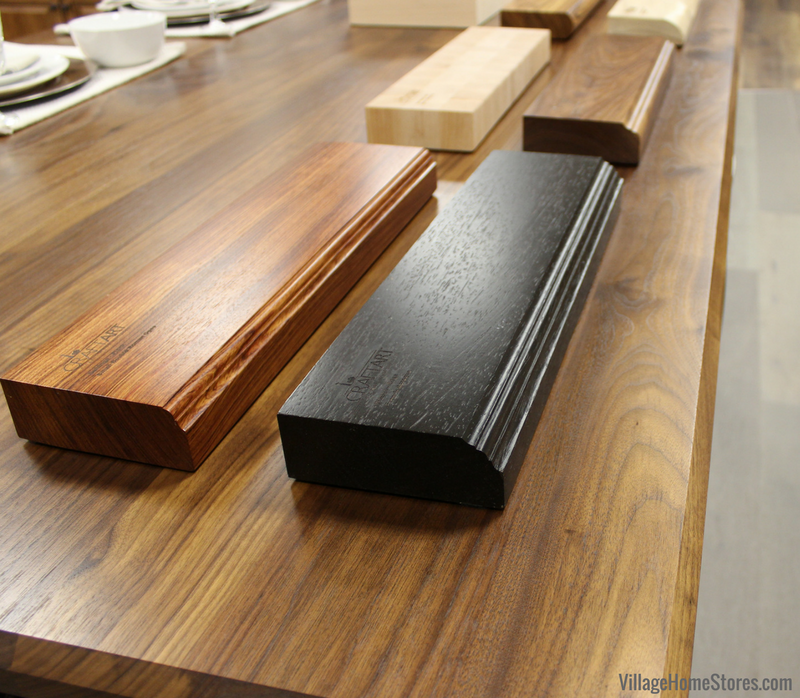 There are many colors to select from in this wallplank product. To keep the space bright in this home, “Biscuit” was used for the ceiling. 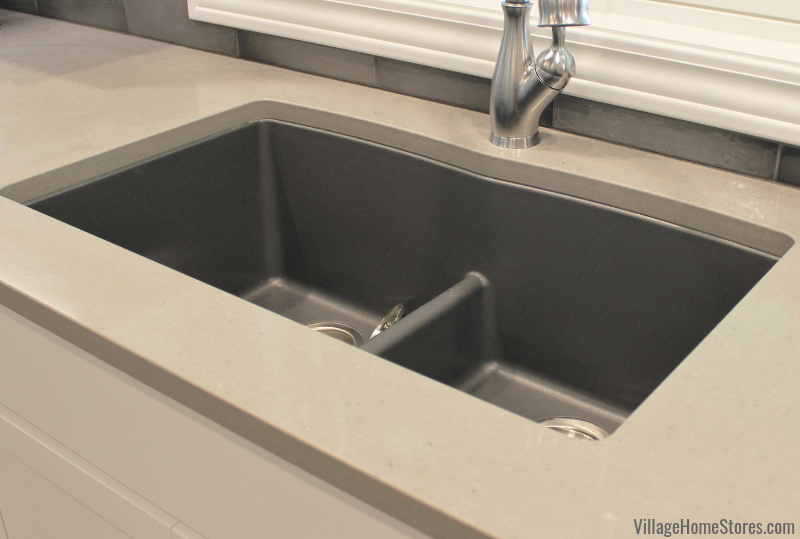 Village installed all of the product for this Coal Valley,IL project but it can also be ordered for self-install by our customers. While a ceiling installation may be tricky to DIY, there may be other surfaces of your home you can consider this product for DIY. 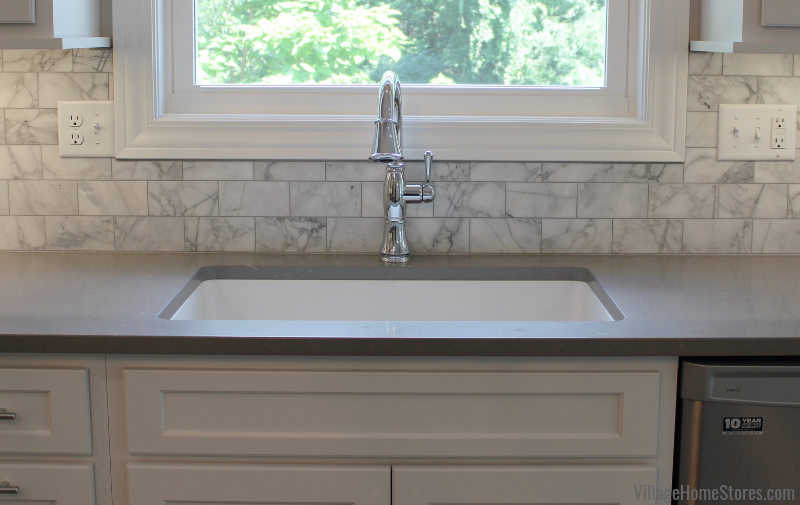 Learn more about how to install this product yourself in this step-by-step blog post we created. A great way to add drama to a space is by creating contrast with colors and textures. 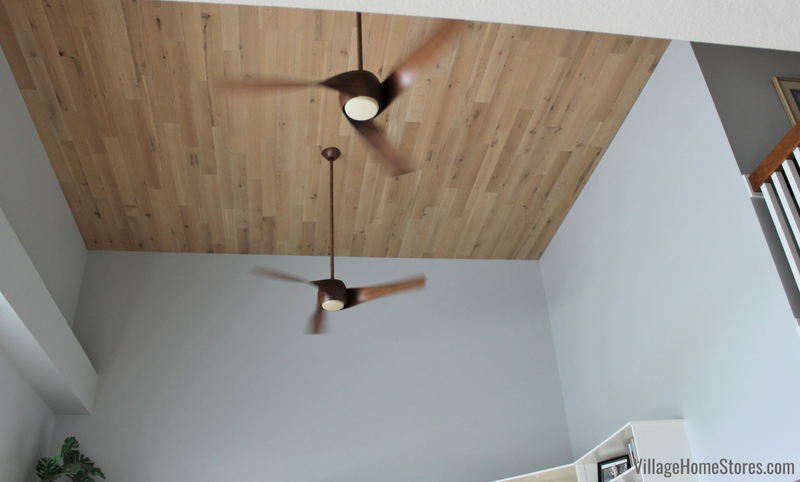 We love the bent wood ceiling fans that were selected from our lighting department for the Living Room space. 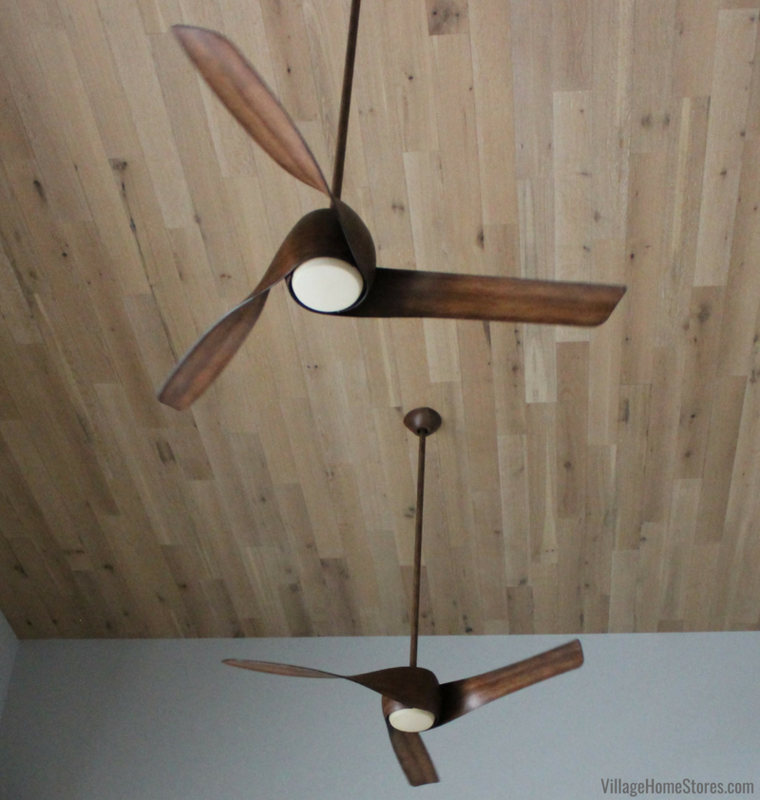 The Minka Aire fans are “Koa” in a distressed wood finish that stands out in color and shape against the wallplank ceilings. 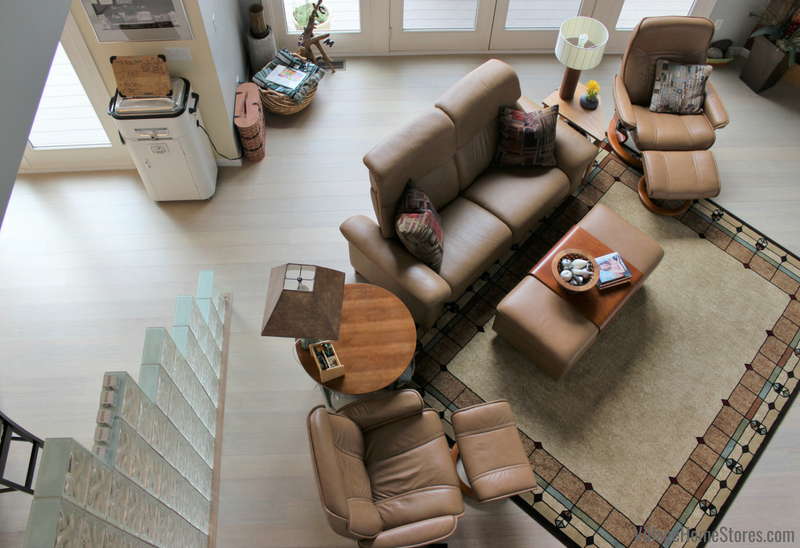 This room is large and the two 58″ fans are perfect in scale for the space. Our lighting experts have access to so many unique new ceiling fan designs. 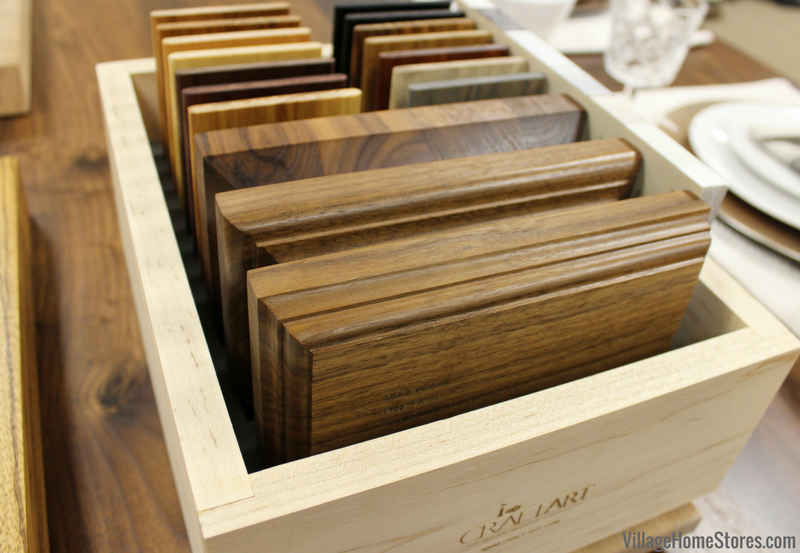 If you have a specific style or finish in mind we would love to help you find the right one for your own space. Amazing new features are also being added in ceiling fans. Decorative “fandolier” models, smart home tech options, bluetooth speakers, and so much more! 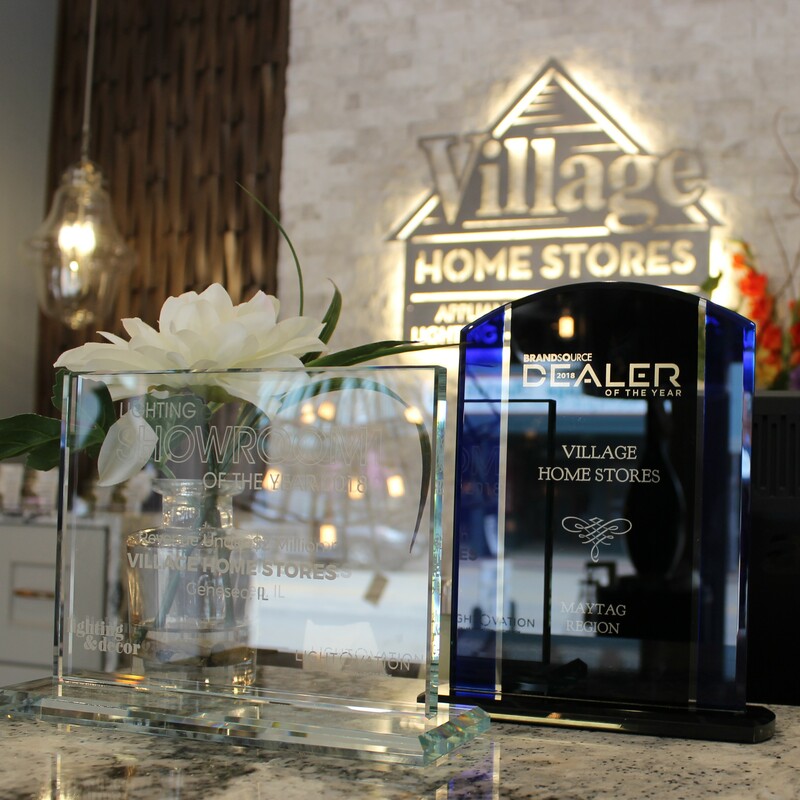 Shop fans and all of our lighting on our website here and visit our award-winning lighting showroom to see many of these models in person at 105 S State in Downtown Geneseo, IL. But we would hate for the ceiling to steal all the attention in this home. 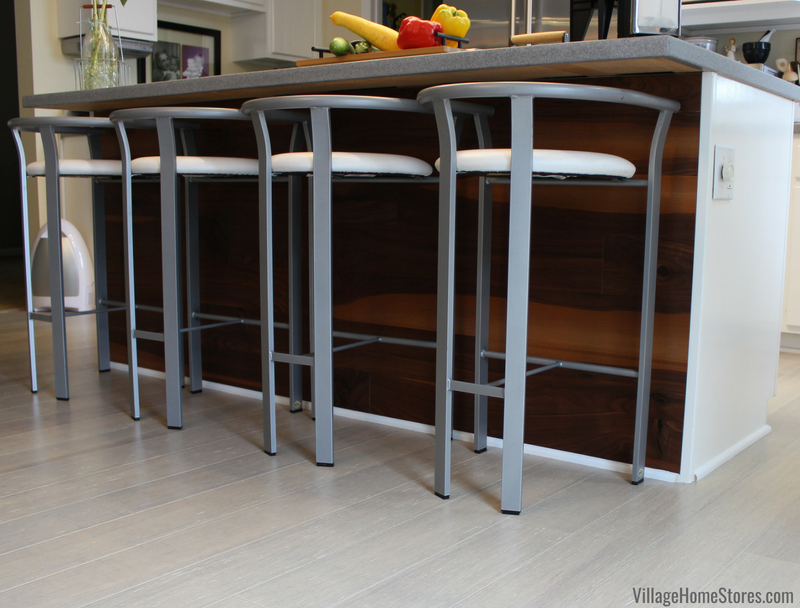 Take a look at the stylish and durable new bamboo floors we installed. 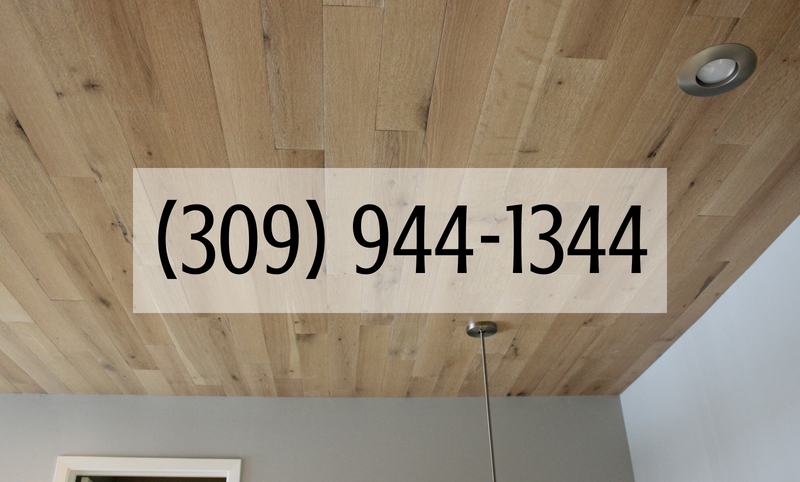 Our USFloors like offers a variety of bamboo flooring options and this 5 1/2″ wide plank floor is a 6 year matured bamboo in the “Frosted Pearl” finish. 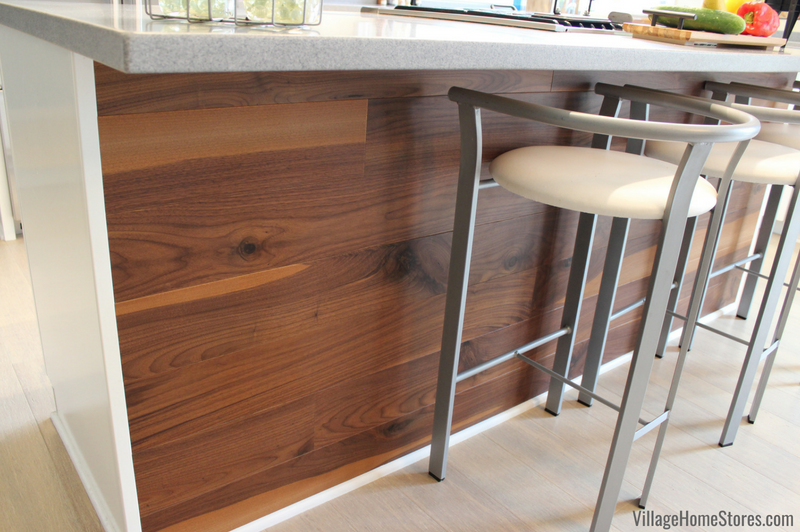 Bamboo has a tight and stylish grain and blends well with many other wood finishes. 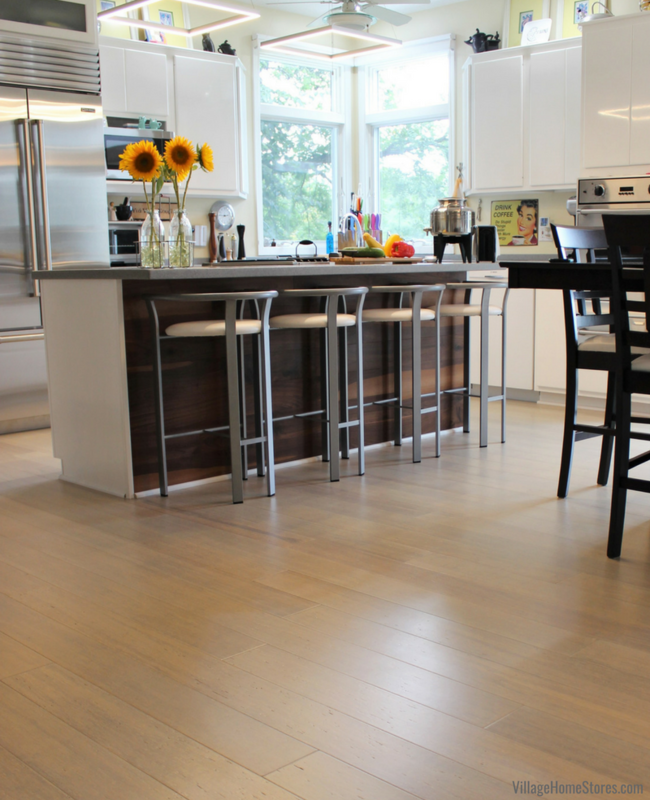 Have you considered Bamboo as a flooring option for your home? It is a very durable and eco-conscious material choice. Bamboo works well in all climates and humidity levels. 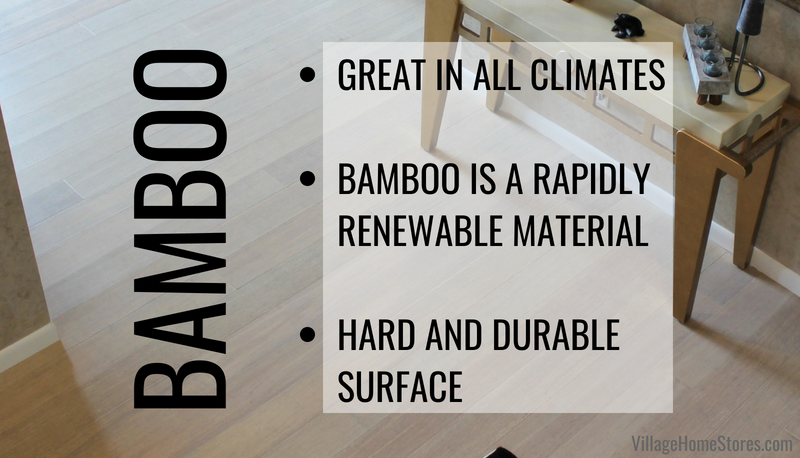 For our extreme Midwest seasons bamboo can be a fantastic flooring investment. Bamboo material renews itself at a rapid rate compared to hardwoods. This makes it an eco-friendly choice for our customers seeking to purchase sustainable products. Bamboo is also a very hard surface. This makes it wonderful for pets and heavy traffic areas. 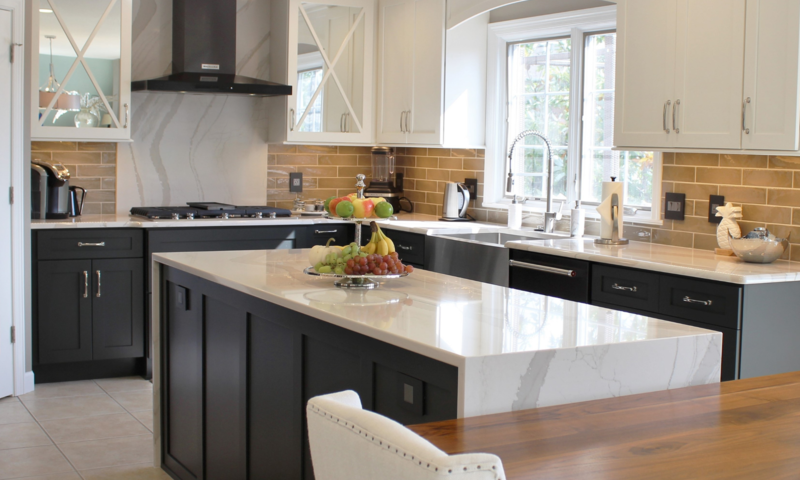 If you love the look of this project you can see the full album of photos over on our award-winning Houzz page here. There you can save them to your own ideabooks a inspiration. 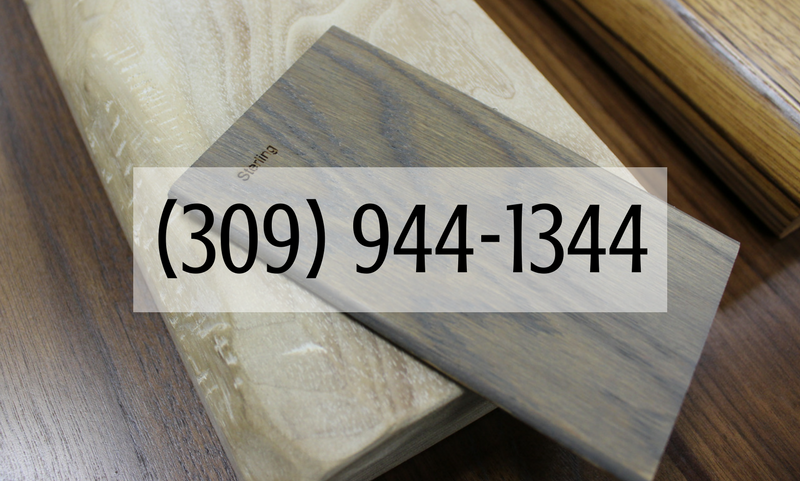 If you have any questions about the products in this post or want to get an estimate on Bamboo or wall plank for your own home just reach out to us. 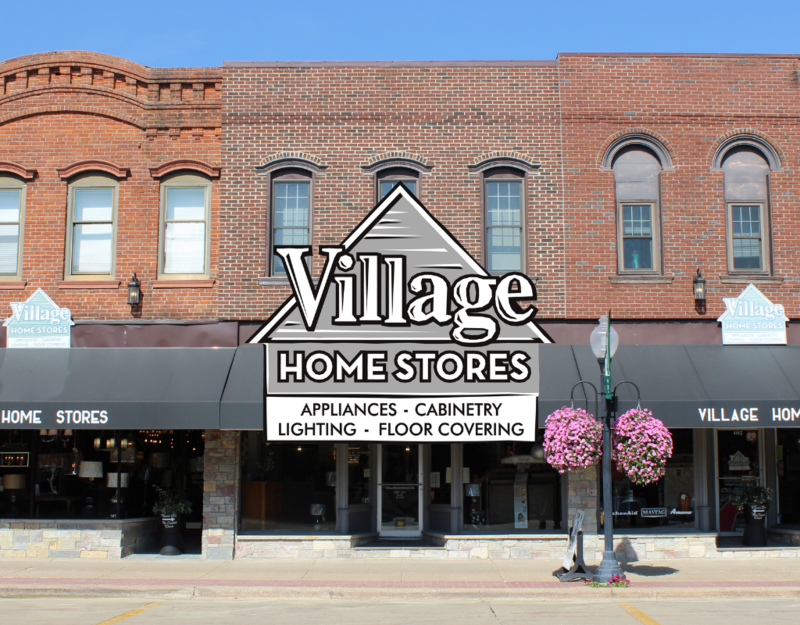 You can call Village Home Stores at (309) 944-1344 or complete this short online form and a member of our flooring and surfaces team will be in touch. 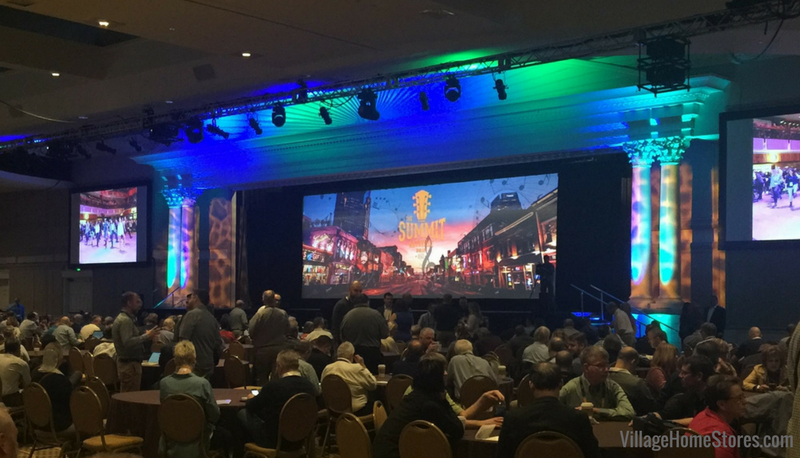 We just got back from the BrandSource annual Summit event in Nashville, TN. Before we brush the dirt off our cowboy boots, we must tell you about what we saw! This event is our opportunity to learn about industry news and projections as well as see new product in action. We had Rachele visit us in the WQAD studio to chat about what we saw on a segment of the Village Home Show. Press play below to watch our recap. Very exciting stuff! The connected appliances are so amazing and like we mentione din that segment, available on very affordable models! You are going to LOVE some of the new features rolling out from our brands. Some have already launched and are available to ship now. Like the new low-profile microwave hood from Whirlpool® (shown below on right). Do you have a venthood beneath a cabinet now and wish you could fit a microwave hood there instead? 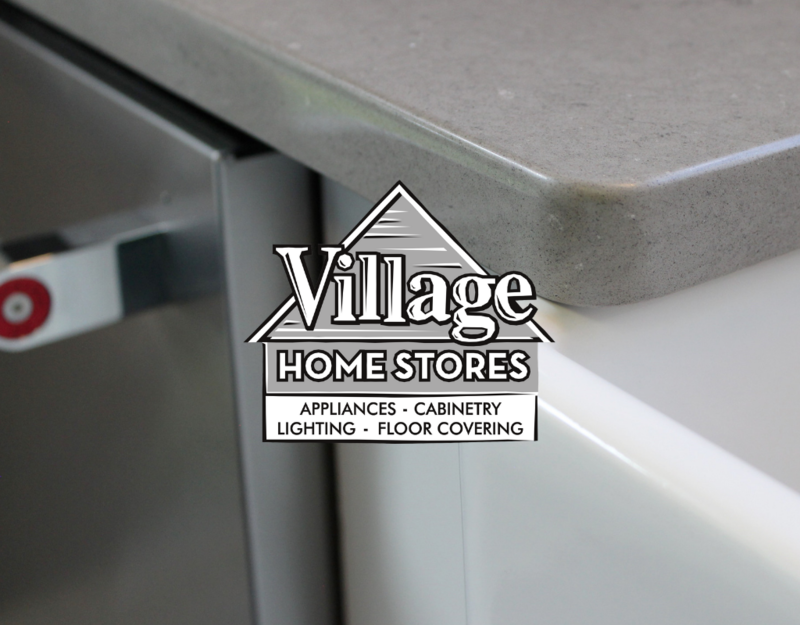 This model allows you to do that without replacing the cabinet above with a shorter cabinet! A 1.1 cu. ft. microwave hood designed to still accommodate tall mugs, wide plates, even a fully popped bag of popcorn. Fitting in the same space as an undercabinet hood, now you can get your microwave off the counter to add space to your kitchen. 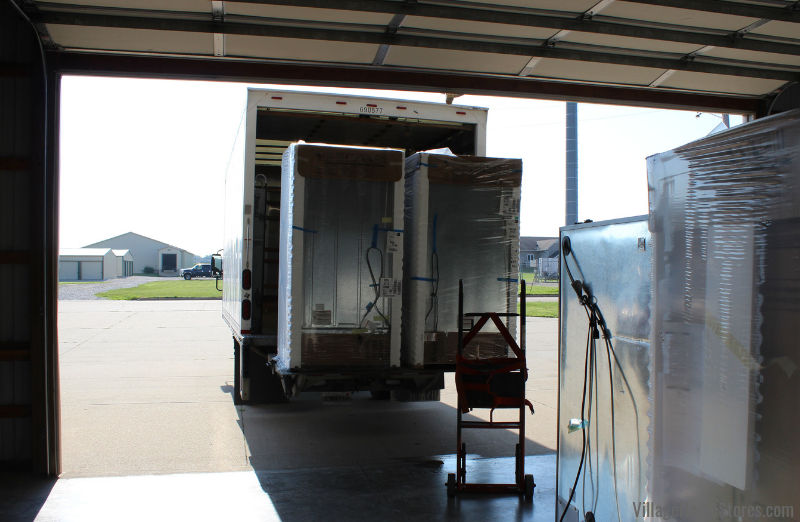 The unit measures 10 1/4″ H x 30″ W x 18″ D (finished sides) and has 400 CFMs of vent power. 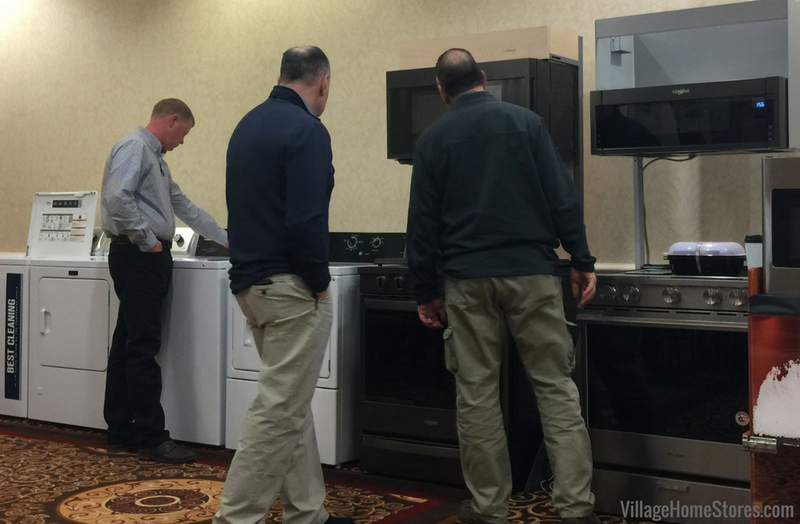 We saw a ton of great new product on the Expo floor and during our product training sessions. Unique new finishes, innovative new laundry features and WiFi enabled appliances with features we fell in love with quickly. 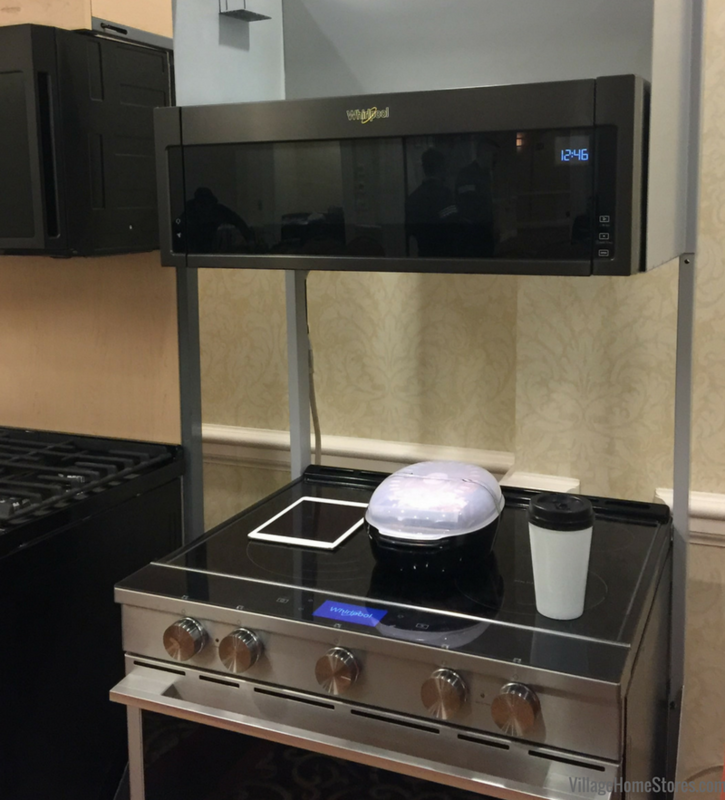 Press play below to see some of the great new products and features we saw from the Whirlpool® family of products in their Expo booth. So what do we mean WiFi enabled features? Why would you want a “connected” appliance? Do you already use your phone, tablet or voice-command device while working in the kitchen? Then you will love connected appliances. 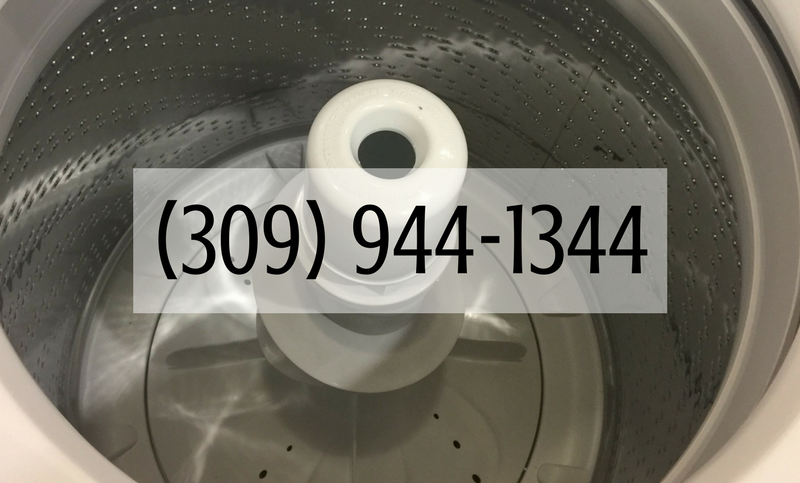 Wish you could check the status of your laundry load or start the dishwasher right as you remember it before you fall asleep? How about simply scanning a microwave dinner box and getting the perfect power level and time entered for you? With Whirlpool®’s new Scan-to-Cook you can do that! 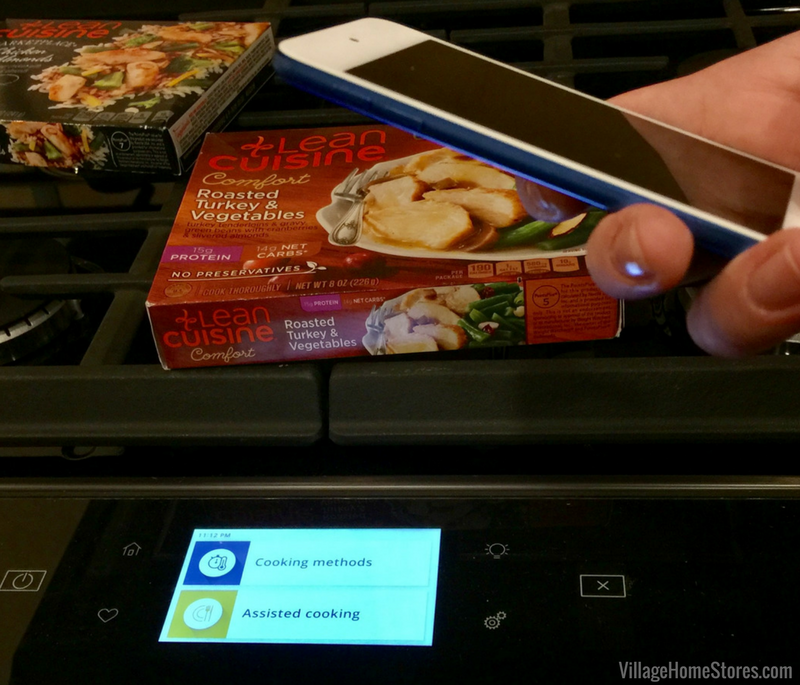 Scan-to-Cook also translates into the connected ranges for the perfect cooktimes and many time avoiding the need to even preheat the oven. 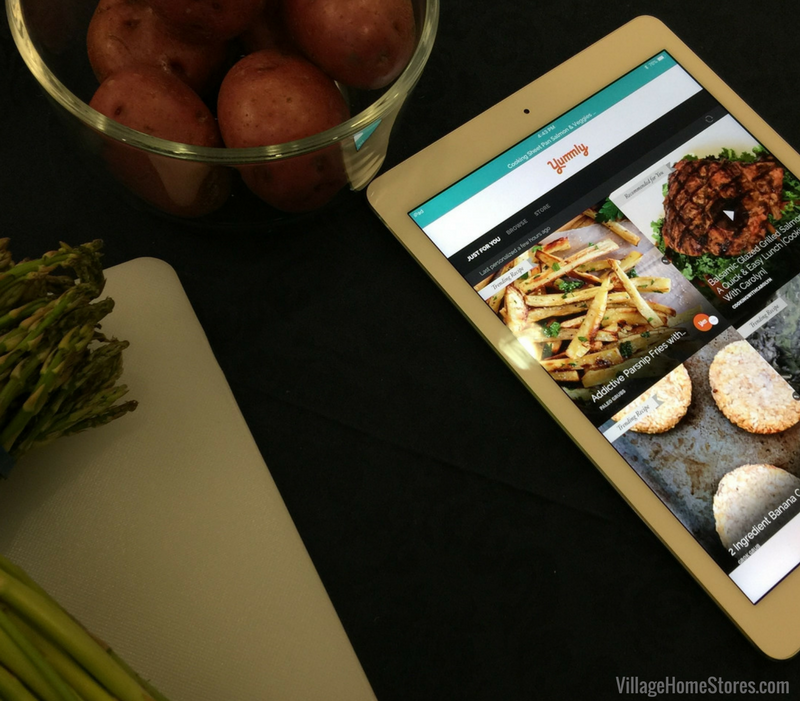 Are you already looking up recipes and setting timers in the kitchen? Access those features directly in the connected ranges. The most exciting partnership with this product launch is the integration of Yummly to the product. The Yummly app is known worldwide as an award-winning recipe app with the tech to help you find a recipe using the ingredients you have on hand. There is even image recognition within the app. What does that mean? It means you scan the ingredients on your counter, pantry, or refrigerator and Yummly suggests recipes you can make with what you have. Then just send the recipe to your range and the step-by-step guide will be right on the touchscreen for you. It sounds like a scene from Star Trek but we promise we saw it with our own eyes! Many of these products are already ready to ship this Spring/Summer. We can’t wait to get our showroom set up to show you how easy this tech is to use. Of course the range also still can operate as a non-connected appliances as well. All standard baking and broiling feature can be entered by any user. 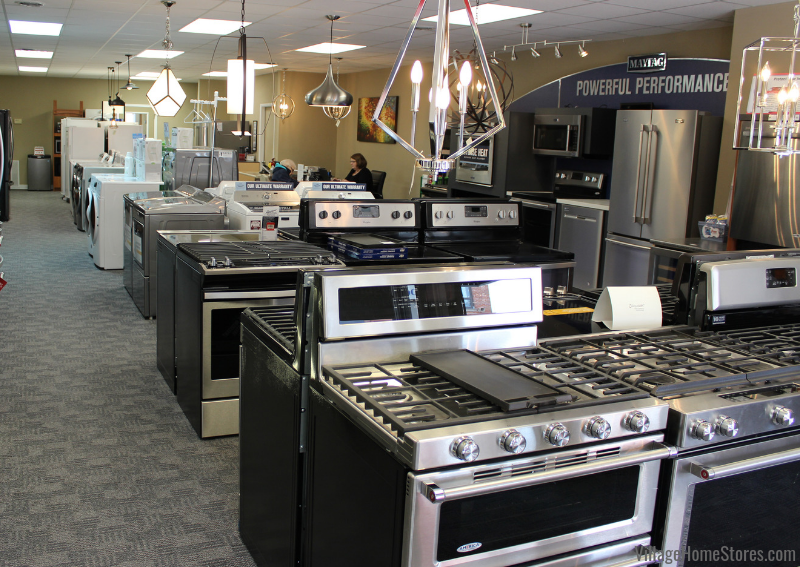 We also saw new features added all across the cooking, refrigeration, and laundry categories. Great options like “vacation mode” in refrigeration or even “party mode” for ice production. Too many to name but so many we are wiling to show you when you stop by our store! Some other exciting new products include a new Commercial series of Maytag® Laundry that our traditional laundry customers will be very happy with. 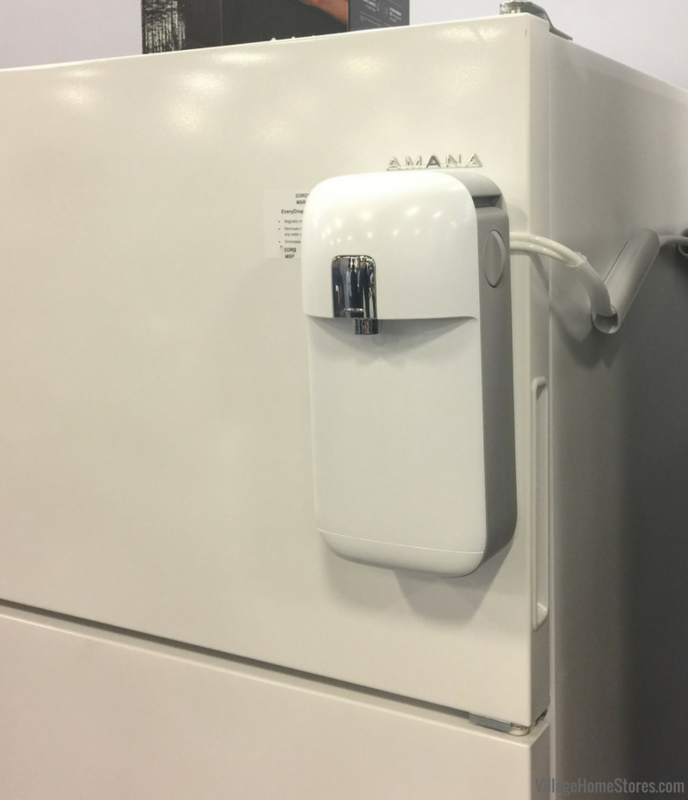 We even saw a water dispenser that can be attached to the front or side of your existing refrigerator to give you filtered water! It attaches with a high power magnet and hooks up to your water line. 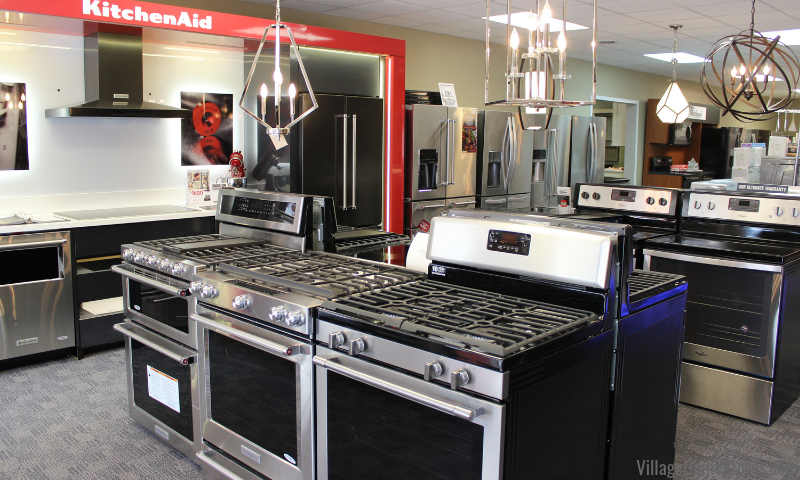 KitchenAid®’s new built-in cooking is absolutely stunning. 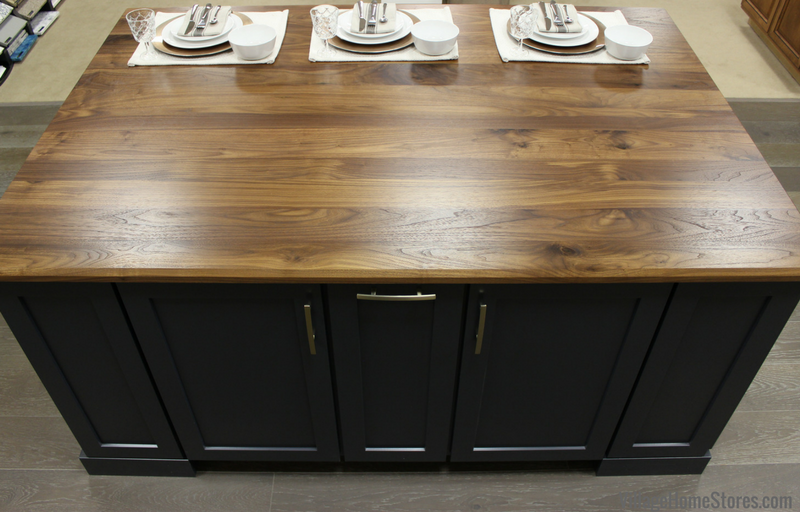 For those who are looking for professional features and the look of a chef’s kitchen, you will love these models. 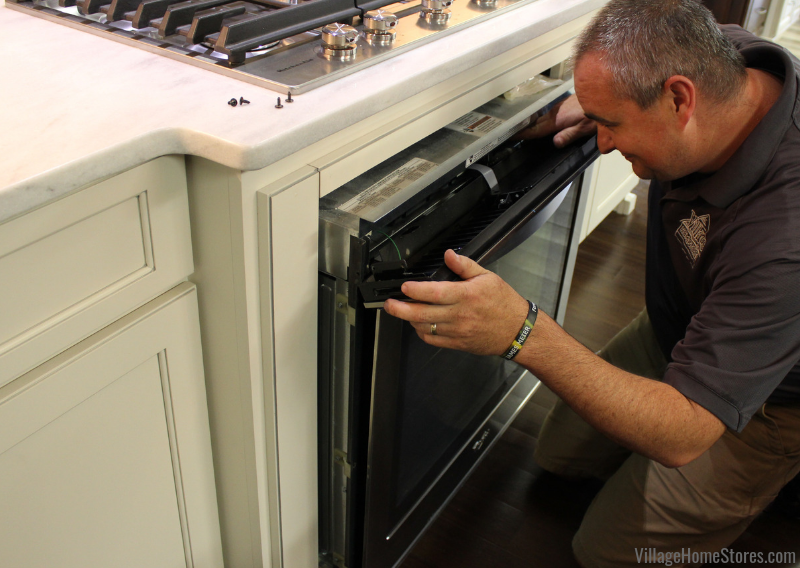 New cooktop layouts and features (like top-lift hinged grates for easy cleaning) and sleek wall oven designs. 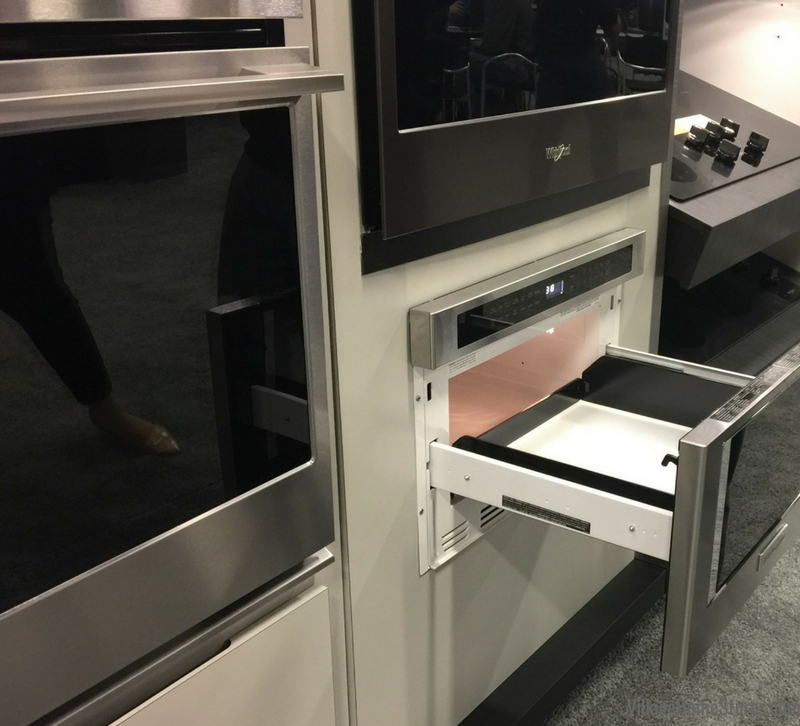 We even saw the new KitchenAid® microwave drawer (shown below). 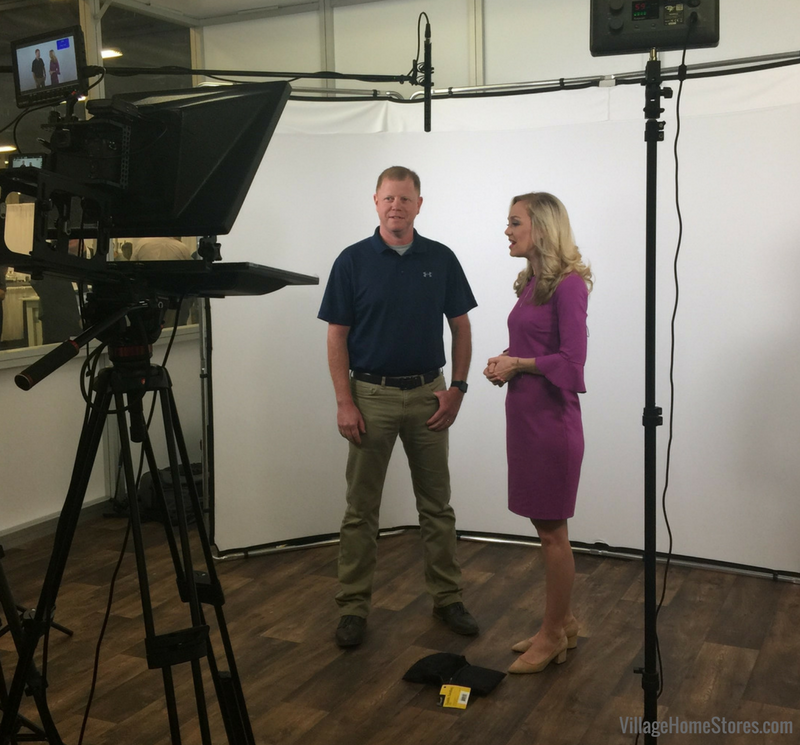 We also got to watch Rob film some welcome videos for our AVBtv showroom experience coming this Summer. So many new and exciting things to showcase and with tools like videos and easy-to-use apps, we promise you all of these “tech” changes and updates are for the better an will help you get the best results in cleaning and cooking. We we able to take in many great training sessions as well as learn about new trends in our industry. We are excited to launch our brand new website very soon and think you will love the new mobile experience while working with our store. Working with our buying group allows us to offer you not only competitive prices but and even better value for the shopping experience with us. 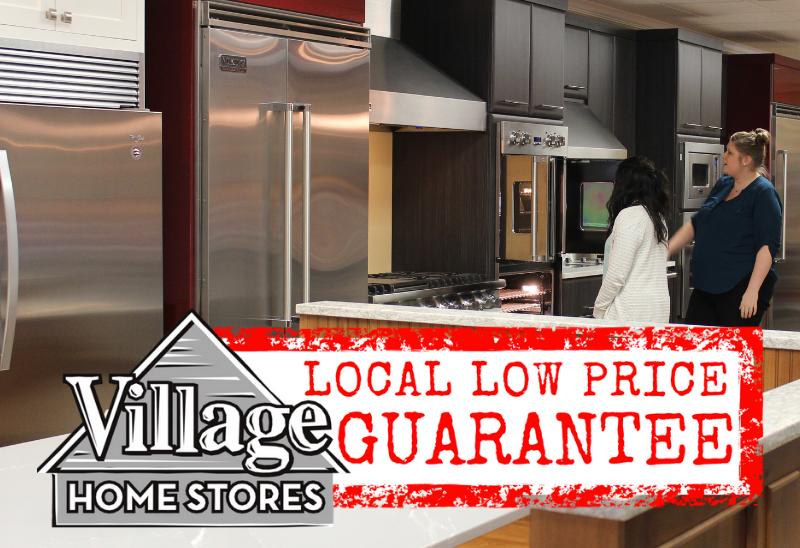 Our customers get to receive our Local Low Price Guarantee PLUS the very best customer experience before, during, and after the sale. 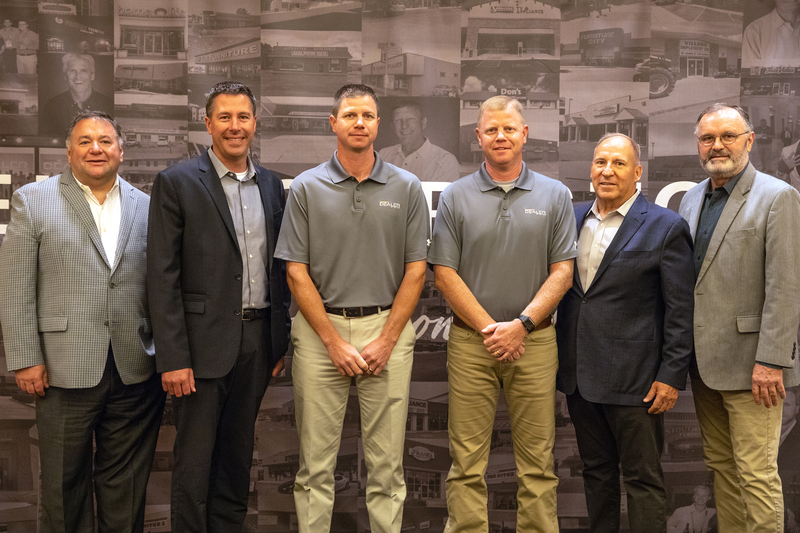 Taking steps toward the future with new products and web features will continue to help keep our small business successful and ahead of its class. 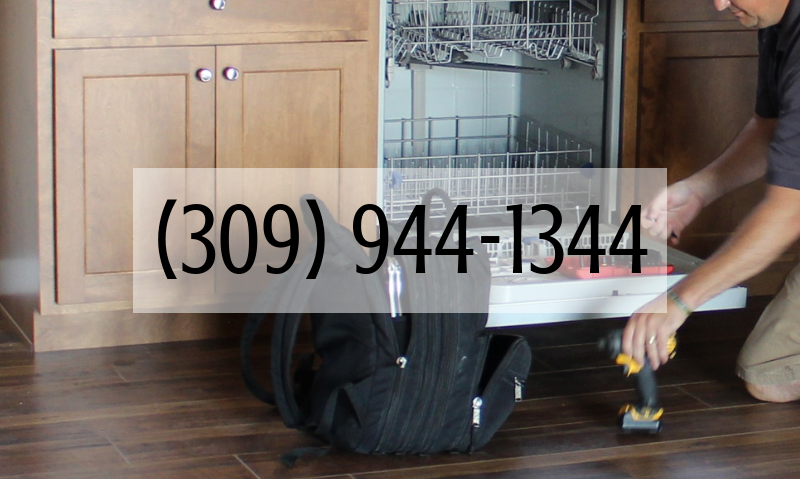 If you have questions about any of what you have seen here in this post please don’t hesitate to call our team. Better yet, stop by the store! There are many great features we can already show you in the showroom and product arriving every week as a part of these new launches. 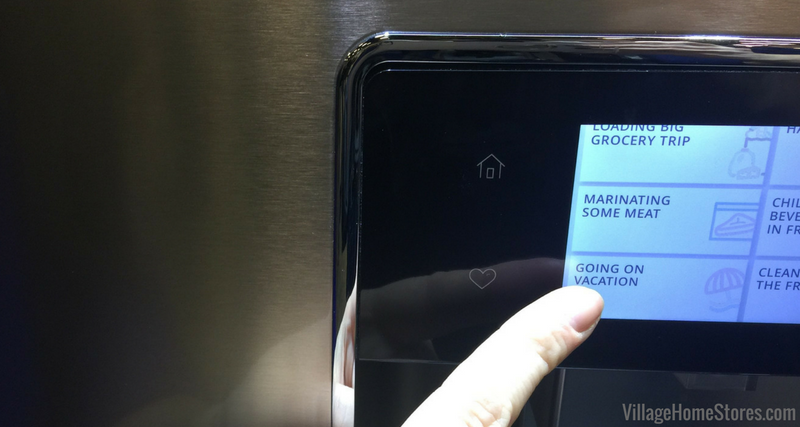 Don’t believe the new Black Stainless Steel is fingerprint resistant? Come test it out yourself! Want to see how easy connected appliances can be to use? We will show you! 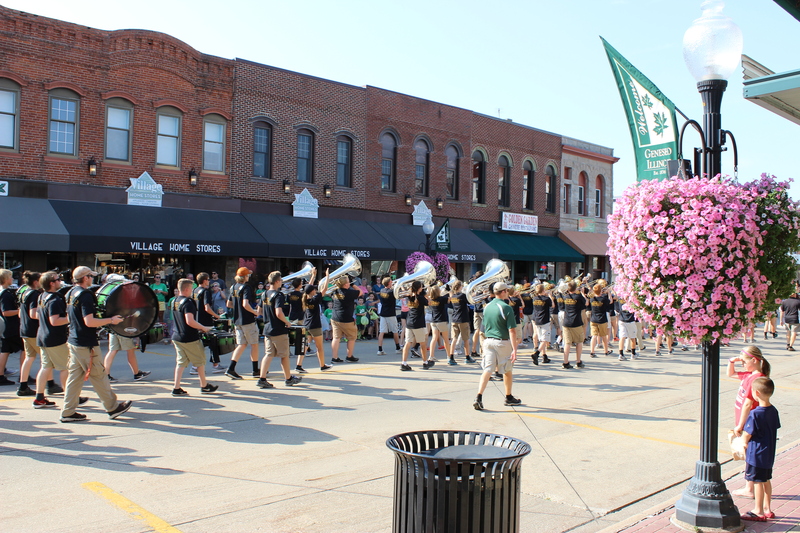 Stop by today at 105 S State in downtown Geneseo, IL contact us online here, or give us a call at 309-944-1344.